The Lake's Hotel & Spa is located in one of the loveliest spots by Lake Wörthersee, directly on the promenade of the traditional holiday town of Pörtschach. Nestled between small picturesque palaces constructed in the Wörthersee architectural style and witnesses to earlier hotel architecture, an exceptional location has been created for you. A place where sophisticated lifestyle and cultivated nonchalance are perfectly harmonised with each other. Your holiday experience in Pörtschach am Wörthersee promises you one thing in particular: your very own personal luxury programme. At the Lake's Spa, two mixed saunas, a women's sauna, a steam bath, several quiet zones as well as a heated outdoor pool are provided for your well-deserved wellness pleasure. Those that especially love to indulge themselves will be well taken care of with the exclusive offer of natural cosmetics and massages. Culinary highlights in Lake's Restaurant will ensure pleasurable moments during your stay at Lake's Hotel. Your day starts at the richly prepared breakfast buffet. Throughout the day, you can dine at the Beach Club, accompanied by cool drinks, while in the evening, the relaxed lounge is transformed into a chilled out party location with Beach Bar. This is complemented by cool beats, the sunset and the view of Lake Wörthersee. At Lake's, you can sense the true Carinthian way of life! The architecture at Lake's is open and spacious, and the design stylish with a maritime flair – both outdoors and indoors. The design elements invite the wonderful view of the turquoise Lake Wörthersee to merge with the interior. The ideal setting to withdraw from the hectic and hustle of the everyday, as well as to lose your thoughts in a southern-Mediterranean atmosphere. What you can look forward to: There are plenty of places to lose yourself at Lake's! 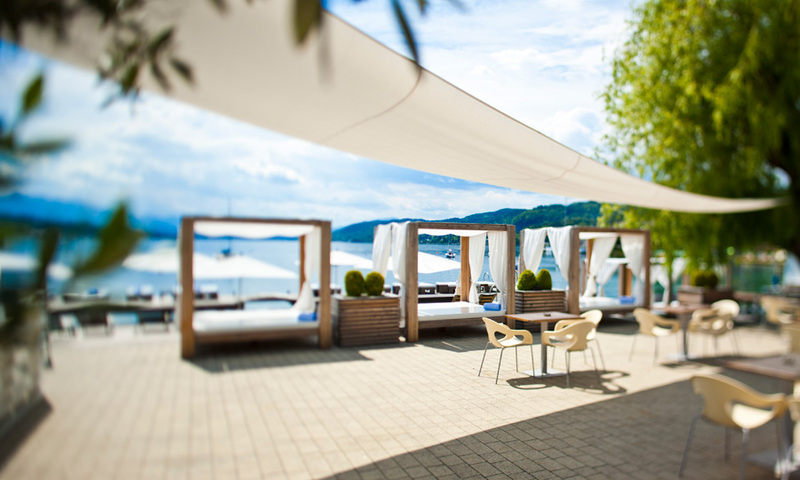 Feel like holidaying in paradise by Carinthia's Lake Wörthersee? Then you've just found your hotel with spa & private beach in the centre of Pörtschach! Choose a room now and send a non-binding request straight away!